This season was all reruns from the first two years. There was some new Mouseketeer material filmed, but evidence for it's being broadcast is lacking. The Mickey Mouse Club was now on only three days a week, the other two being given over to Adventure Time. The producers were not quite ready to call a halt to new material for the Mickey Mouse Club in January 1958. Even as the third season was being broadcast, a pre-production number (for accounting purposes) was opened for a fourth Spin and Marty serial. There were likely some concerns about cast scheduling conflicts between the proposed film, The Rainbow Road to Oz, slated to use seven Mouseketeers, and the television show. 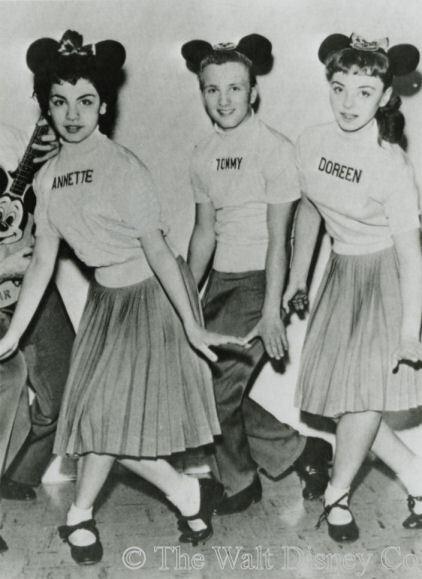 During January and February 1958, Jimmie Dodd, Annette Funicello, Doreen Tracey, and Tommy Cole were sent on a publicity tour to the East Coast and New England. (This was the trip on which occurred the oft-repeated story of Jimmie and the mice stopping at a random house and watching the broadcast premiere of Annette with the homeowner's kids). The teenagers were accompanied by their mothers and a tutor; they told reporters it was the first time they had seen snow, but that they were worried about the show because "the contracts haven't been signed yet". That same month, the film project was cancelled, and the decision made not to recruit replacement Mouseketeers for the coming season. 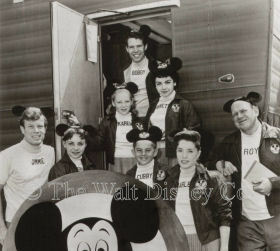 Sometime in late March of 1958, a number of Red Team Mouseketeers were called back to the studio from the usual hiatus. 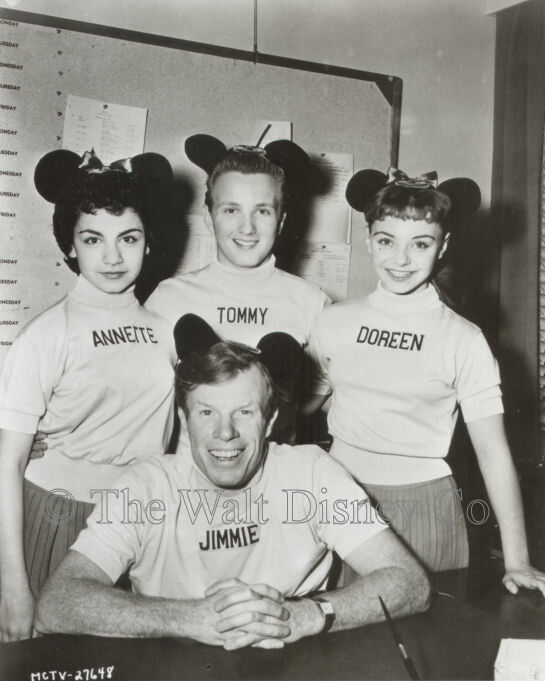 Not all of them seemed to have been actively working at this time (see note at bottom), although according to Daily Variety, all nine main mice had been re-optioned in late 1957, with Darlene Gillespie and Tommy also being given separate recording contracts. All the contract options would come up for renewal in May 1958, but until then they were kept busy rehearsing, recording, and doing photo layouts for publicity and advertisements. One new episode they might have taken part in did make it onto the air. 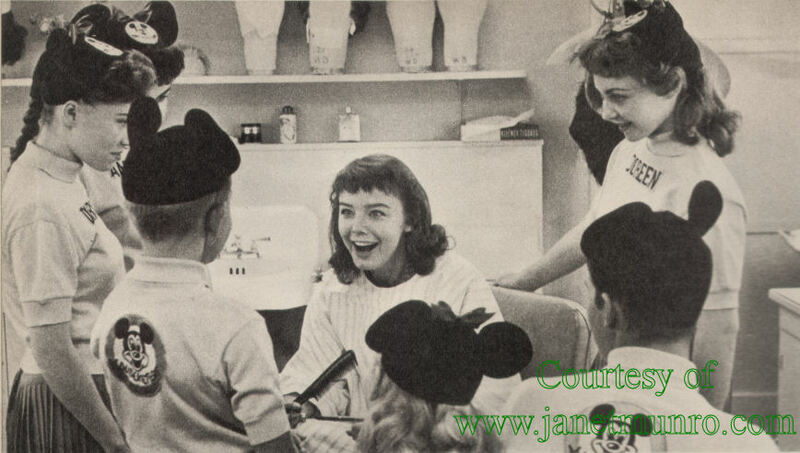 This was part of an Anything Can Happen Day, done with British actress Janet Munro, who arrived in America on March 3, 1958. Called Darby O' Gill, it promoted the live-action feature then filming on the studio backlot and on sound stage four. This show wasn't broadcast until June 24, 1959, two days before the film's US premiere and over a year after it was made. 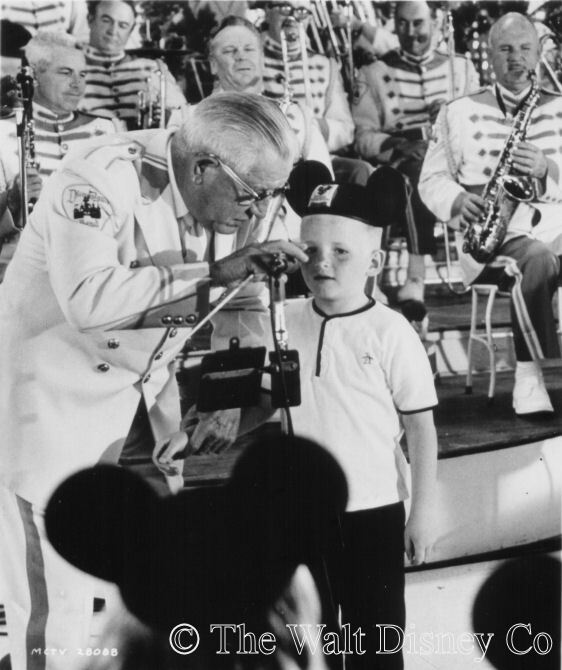 It was the last original broadcast of the Mickey Mouse Club, though whether the Mouseketeers participation made it past editing is unknown. In its original hour-long format The Mickey Mouse Club occupied two of the three sound stages available at the Burbank studio. However, during the last half of the second season, the show's ratings declined by as much as fifty percent, though it still dominated its time slot. The lost ratings, and subsequent reluctance of sponsors to pay top dollar for advertising, threatened to impact the show's profitability for ABC. Meanwhile, Disney producers took a hard look at their studio resources. The start of filming for Zorro in early 1957 would take technical crew and equipment away from the third season of The Mickey Mouse Club, and largely confine it to sound stage 1 or expensive location shooting. The shortage of space and diversion of resources would make it hard to produce the same amount of content in the same time frame as previous years, while the loss of ratings made the producers wary of committing more resources to a program that had yet to show a profit. For the third season, then, the show was reduced to a half-hour. By early 1958, even a half-hour Mickey Mouse Club was too much. Despite the recent construction of a fourth sound stage, the studio was hard put to be hosting three television shows, and doing live-action films. The backlot needed to be shared between Zorro and two films: Darby O' Gill and the Little People (first half of 1958) and The Shaggy Dog (second half). Zorro also needed one of the sound stages (2), as did the Darby film (4), and The Shaggy Dog (3). This meant Disneyland would have had to share stage 1 with The Mickey Mouse Club, now perceived as a bottleneck, and an highly unprofitable one at that. By May 1958 the decision had been made... new production for The Mickey Mouse Club would halt. The final scenes filmed, according to Annette's much later recounting, were happy reaction shots to an unspecified performance. Whether this episode made it on the air is unknown. Annette, Cubby, and Karen were offered option renewals, but the latter two declined. 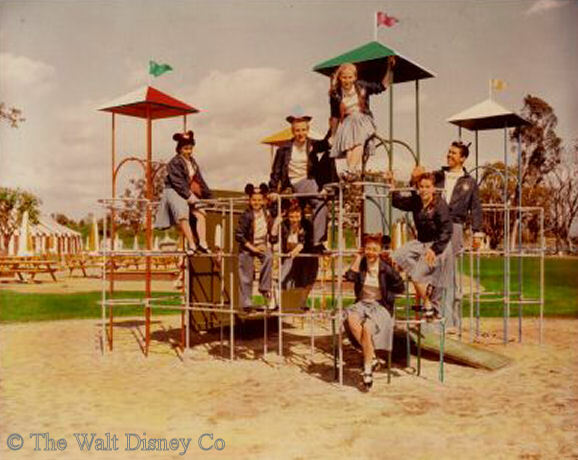 The remaining Mouseketeers had their options dropped, though a year later six would return for a tour of Australia. The Disney film editors crafted an entire season of half-hour reruns from the first two years, supplemented with the few hours of new footage created in the short period of filming during spring 1958. No material from the third season was shown during year four, while the amount of first season material used was roughly two-thirds of the total. The half-hour shows of season four were also quite different in format from either the third season, or the later syndicated shows of the sixties, which were based on the third season pattern. Giving a nod to the popularity of the dramatic serials, the producers turned Tuesdays and Thursdays over to a "new" show called Adventure Time. This consisted of two or three serial episodes shown back-to-back. All three long dramatic serials of the first season were used, with some of the more popular short series, such as Border Collie, Sierra Pack Trip, and San Juan River Expedition. Also shown was a long serial from the second season, The Mystery of the Applegate Treasure, and two shorter ones, Adventure in Dairyland, and Secret of Mystery Lake. (The original introductory episode for the longer serial was not included). On Monday, Wednesday, and Friday, a half-hour Mickey Mouse Club was shown, which still followed the daily rotation of themes. However, in addition to the familiar "two-long, one-short" pattern of feature segments from the third season, the producers also employed a four-segment pattern. This was usually accomplished by splitting the original segments in half and showing them on multiple days. For instance, a typical fourth season Talent Roundup Day might include one-half of a talent winner segment (remember that most winners shared a day with another act), one half of a Sooty episode, a cartoon, and a Doddism. In addition to the recycled footage and the Darby O' Gill episode mentioned above, there was some other new material produced and broadcast during the fourth season. A two-part serial originally shown on Disneyland during 1957-58, called An Adventure in the Magic Kingdom, was shown on Adventure Time. As the name implies, this was an extended commercial for Disneyland. For the Mickey Mouse Club, there was a new Anything Can Happen Day episode. This had the previously-mentioned Darby O'Gill promotion, coupled with a short piece called Cat and Mouse, which may have been an extended clip from the film. The decision to forgo new material and rerun cut down versions of the original shows had a predictable effect on ratings. The final straw for the few faithful viewers still left may have been when these reruns were also rerun, from March through September of 1959. Still, with an outlay of some $300,000 the network and Disney realized over half the income of the third season, for only 10% of the expenditure. The lion's share of the profit, as always, went to ABC, but this was likely the first time the studio made money from domestic showings of The Mickey Mouse Club. (Foreign sales are another matter). In a recent online interview, Jodie Carn asked Doreen "And you were on the show all three years? ", to which Doreen replied, "Three and a half". It does appear that no more than six Mouseketeers were called back to the studio for publicity work and a little filming in spring 1958. They were Annette, Darlene, Doreen, Bobby, Karen, and Cubby. Tommy and Sharon did some publicity work with the other mice at this time, but were not employed as regularly by the studio.